I posted earlier today about the Gratitude Challenge that I am undertaking as a result of a post from Brett Salakas. I, and I suspect many who blog and/or Tweet do this as well, have my Facebook and Twitter accounts connected to my WordPress account so that when I post an article here it also appears on Twitter and Facebook. Today’s article saw some responses from family on Facebook, and my mother and sister have both also undertaken to complete the challenge, which is great. In the session after I posted that article, I had a ninety minute block with a Stage Two class, where the teacher had left the next lesson in a unit of learning about poetry for me to complete with the class, with the focus on cinquains. The first thing I did was show them my Twitter account, and tell them that I would be posting a few of the cinquains the class developed onto Twitter to show the world what they were able to create. For some they were not particularly phased by this, but for others, it seemed to provide an incentive to put in more effort than I suspect they may have otherwise. Using Twitter in this manner in the classroom provides students with a global audience, a a reason for actually completing the learning task. The other alternative, which I would utilise more in classes with easier access to technology, would be Storybird, which allows students to create a book using the vast array of art work. 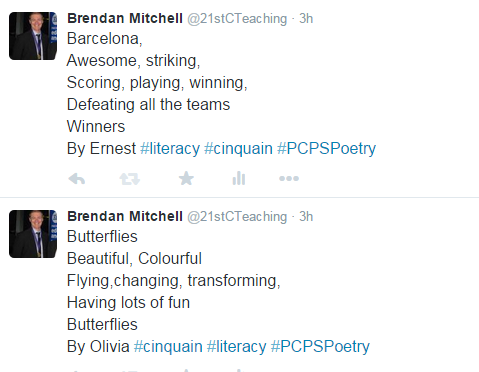 I tweeted some of the cinquains that the students wrote, but I include them here as well. A cinquain by Hollie in Stage Two. Written on 13/08/2015. Barcelona by Ernest, and Butterflies by Olivia. Both written 13/08/2015. Seeing students engaged and excited by something that I strongly suspect they would struggle to find interest in is something that brings joy to me, and makes me grateful for the technological era in which I am working as a teacher. The opportunities that I can offer my students are far more numerous than my colleagues could offer twenty years ago, and I can see the differences. Talking to colleagues who have been in the profession for thirty or more years, they also can see the benefit, but make comments such as “I wouldn’t know how to do that,” or “I could never do that.” I know that they could learn how to, but that there is a level of technological fear involved, which I can understand. I thank you for reading again, an odd occurrence to have two in the one day, I know. I do not normally write articles over the weekend, but I will endeavour to post articles for the Gratitude Challenge at the least. 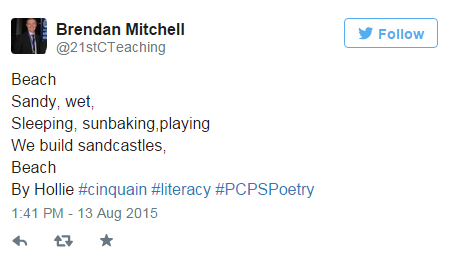 Posted on August 13, 2015 by Brendan MitchellPosted in UncategorizedTagged 21st century learning, Cinquains, Edtech, education, Joy, Poetry.